Part of being a private investigator is telling people things they don’t really want to hear. Sometimes that includes hourly rates. We’ve all been there. When a client asks how much this is all going to cost, and they get a response that makes them wince. Something along the lines of $100 an hour, four hour minimum, with a $1,600 retainer. As far as the total cost, I won’t know for sure until we get the investigation started… BUT you get a detailed report, with digital video, and pictures – as if this will make a difference. We know that we have expenses, and that we’re not just making out like the very bandits our clients are hoping to catch. But a prospective client only sees the dent in their bank account – regardless of how many pictures, videos, or reports they get. You lost them at $100 an hour. They’re probably subconsciously comparing their personal hourly rate with ours – and they’re probably doing the math to figure out how many hours/days they need to work to pay for one hour of surveillance. To a client, pricing in terms of hours and days is just an expense. It’s disconnected from outcomes, and it’s disconnected from value. When we quote time, they see a cost, not a result. And that’s when they either go price shopping or they ditch the idea of hiring a private investigator altogether. That’s not good for anyone involved. So how can we make our pricing more user friendly? When we hired our company attorney to incorporate our business, we were told their rates were $250/hour, and he would need about two months to complete the work. My immediate thought was: $250/hour, across two months, if he’s very conservative with his prices, we’ll be looking at $6,000 to $8,000. He finished off the proposal by saying: The total cost to you will be $1000. That “total” price made all the difference. Open-ended pricing will scare away anyone but those with bottomless pockets. There’s too much risk on the client’s part. What if we’re slow or inefficient? What if the investigation never ends? What if it does, but they have nothing to show for it? All-inclusive rates can help ease a client’s fears. By “chunking” our time based on the tasks we’ll be completing, we can break down an investigation into multiple components, making it clear as to how much time we’ll be spending on what. This does a few things. It helps demystify the PI process by outlining what we do and how we go about it. And it shows a client where their money is going, and most importantly that none of it is wasted. Client: How much does an investigation cost? Once they become an active client, then we can provide a rate sheet of further tasks that may be required depending on the case. Again, these can be broken down by time and outcome, with a predetermined “cap” that will be lifted only with the client’s agreement. Packages are a lot easier to swallow than – “$125 per hour with a 4 hour minimum and a $1,500 retainer – we’ll give you whatever is left over after the investigation is complete – unless we go over the budget, at which point we’ll require an additional $1,500 to continue – oh, and we need a credit card on file.” – this type of sales pitch just goes from bad to worse. Task-based pricing approaches are a step up from the hard-to-quantify hourly rate. But they can still be further optimized by focusing on value. It becomes easier to sign off an agreement when you understand where your hard-earned money is going. It’s even easier when you understand the return on your investment. Shifting our pitch away from “output” (what we do) and towards “outcome” (what the client gets) can make a huge difference. The whole proposition changes, becoming focused on them and how they’re going to benefit from our work will always outsell our need to make rent at the end of the month. When coming up with a pricing proposal, the best thing a private investigator can do is focus on value. Don’t just tell them that your fee includes a 4-page report and high definition video along with a few snapshots. Highlight what this means to them in terms of providing leverage in court. Don’t leave “preliminary investigation” as a simple line item on an invoice. Explain its value in guiding subsequent surveillance and PI activity – narrowing down your efforts and likely saving your client money. And finally, define exactly what a successful outcome is. Doing so ahead of time manages client expectations and ensures that you’re aligned on what’s expected when all is said and done. 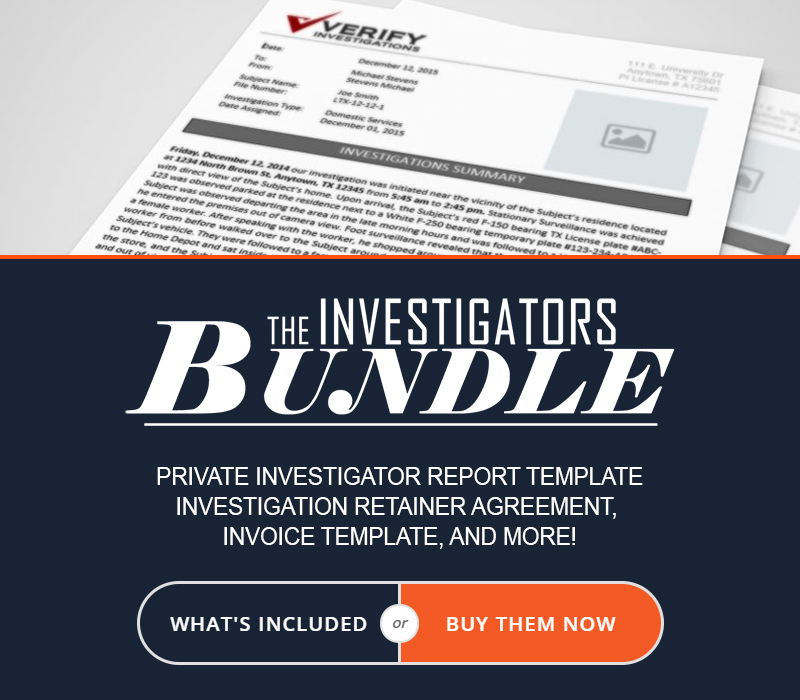 So the next time a client asks you how much an investigation will cost, skip the “hourly rate,” break down your investigation into separate tasks, focus on the outcomes, and quote them flat fees. Your client will come away with an understanding of the type of results they can expect to get, along with a fixed agreed-upon price for a limited task – best of all, this eliminates buyer’s remorse.